Speed, Corflute Combat, Classic B Team Race. The many deep puddles on the last bit of Old Wells Road before the flying field suggested we might be in for a wet old time at the Frankston club. However, the dreary weather quickly cleared and soon gave way to bright winter sunshine. It became an excellent flying day for the enthusiastic band of control liner flyers that turned up for a fun filled Sunday. 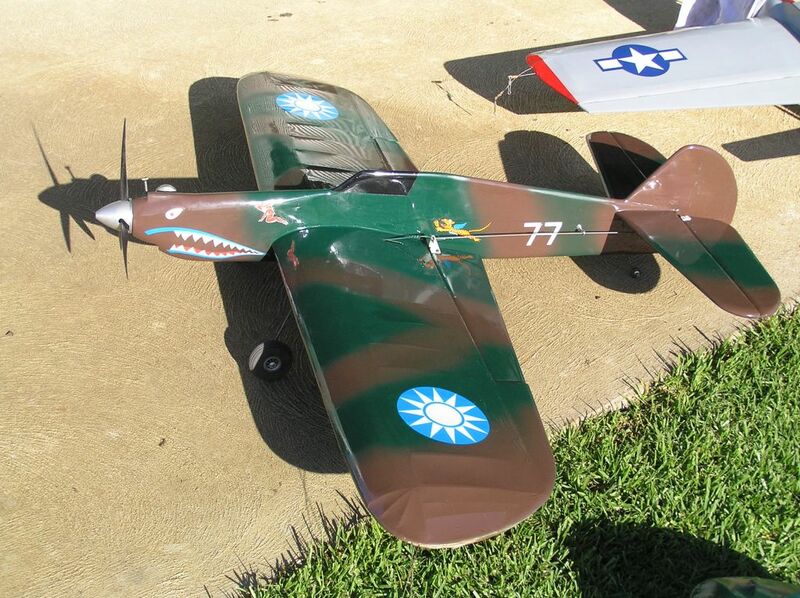 Super Tiger 46 powered Brodak P40 Warbird. Combined Speed was well supported with ten entries. Robin Heirn was the winner flying an OS 25FX Swooper in Vintage Proto recording 97.25% of the record. Ken Hunting was oh so close with 97.1% with his OS 10 1/2A Proto. John Hallowell was third with 94.27% in Vintage Proto with his Classic B Rocket and tuned OS 25FX. Robin had strained shoulder muscles , so he flew left handed so as not to aggravate the condition. He also flew some of his older and slower models. It was good to see Noel Wake back in the thick of the speed action after recovering from his recent health setback. Vern Marquet had a trouble free day flying his reliable K&B 29R Vintage Proto racer. Perky was also flown with four entrants. The eventual winner was Andrew Nugent who recorded 42.47, the speed closest to the average of 44.08. Fastest Perky belonged to Graeme Wilson who posted the really quick time of 38.71 seconds with his Super Tigre X15 ST model. Won’t win a Perky competition, but great for bragging rights! A big thank you is due to the hard working timekeepers, particularly Ron Savage and Phil Wake who kept time tirelessly for the entire competition. Over on the other side of the field all eyes were on Mark Ellins and the first flights of his magnificent new P-40 Warbird with a Super Tigre ST 46 and three blade prop up front. At the end of the session, Mark had made a few trimming tweaks to this fine profile stunter and was seen to be smiling. Gavan Opperman also had quite a few flights with his LA 46 Mirage. The wind then sprang up for a while and most of the stunters were put back in their hangers (read backs of cars) before the breeze died down and they were brought out again. Can’t let good flying conditions pass by! Graeme and Murray Wilson bought down four corflute combat wings with PAW 2.5 diesel power. Lots of people had a go at flying them and most were amazed at what they could do. Expect to see even more at the field in the not too distant future. Can’t wait to see some streamers on them… Definitely a lot of fun! Fiona and Rebecca Wilson came to the field around noon to help fill the bellies of the hungry hoard with a decent lunch of BBQ sausages and lashings of tasty onions. Many thanks ladies! After lunch, Gavan Opperman was seen testing his bright yellow Rocket Classic B with a Brodak 25R up front. Harry Bailey and John Hallowell had Classic B models ready to roll for a bit of competition, but it seems everybody was having such a good time doing other things we just didn’t get around to having a fly! In the late afternoon, it was Ron Lacey and Andrew Nugent who kept the circle warm while testing an impressive sounding F2C. It was another top day at CLAMF when the focus was on fun in the sun rather than intense competition. Just being there and taking part is what this day was all about.